A famous piece of Indian home decor, Bells Totas are hand crafted. The bell attached to each Bell Tota is supposed to keep away malevolent spirits and confer good luck upon a house hold, 24 inches in length. Handmade in India using upcycled sari fabrics by craftswomen from a remote village in northern India. 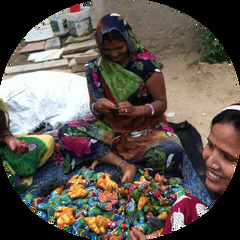 Every tapestry supports a wonderful Indian tradition while reflecting your commitment to sustainable living. Please allow for variations in colors. Made from recycled metal and food safe. This 10 inch bowl flexes into many positions to hold foods or casserole dishes. Made from recycled metal and food safe. This 13 inch diameter bowl flexes into many positions to hold foods or casserole dishes. Metal products are made from flat sheets of scrap metal and created by using basic hand tools and machinery. Metal work is a craft practiced in Behat in the northern state of Uttar Pradesh, India. Made from reused metal. Coated in protective color layer. Size: 15 inches W by 2.5 inches D.
Made from recycled metal and dipped for color this fruit bowl is food safe. Measures 10 by 10 inches. Also looks great as wall hanging.